Lovely day at the 34th Annual Long Island Pickle Festival, held in Greenlawn a couple weekends ago. Although I was disappointed that dogs weren't allowed at the festival since I had Marley for the weekend, Team Jilli Dog ably provided my "canine wackiness" fix for the afternoon (videos below). I met up with my friends Bette and Gene in the early afternoon, and we did our best to experience a little of everything the Pickle Festival had to offer. Horman's Best Pickles had a booth with free samples of about ten different pickle flavors, and each of us wound up purchasing multiple quart-containers of salty, spicy, cucumbery goodness. (I got one quart each of the brown mustard and the jalapeno variety - delish.) 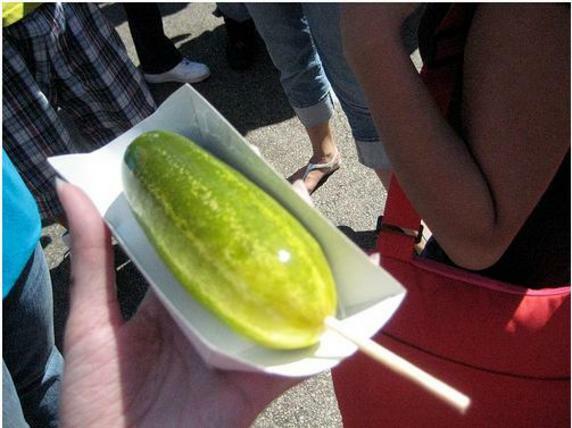 Also ate a pickle on a stick / nts right there. Also onsite were many non-pickle-related vendors, including hot sauce purveyors, pie / cookie / fancy loaf bakers, a specialty meat shop from Ridgewood, Mr. Hoi's Beef Jerky, as well as corn-on-the-cob booths, hot dogs and pretzels, and so forth. Of particular interest to my little crew was the restored Lollipop Farm Train, the history of which figures into a book project I've been working on with Bette, Gene and others for nearly three years (see below also for pictures of the train). Yadda yadda yadda, a good time was had by all. See you next year!